Our team delivers a 20′ or 40′ storage container for you to load; this connex box can be loaded into a ground level container on site. We give you a much time as you need to pack your items the way you want them, taking the hassle and stress out of the move for you. When you’re ready, give us a call and we’ll transport the items to your new address. When it comes to local moving and storage, we’ve got you covered. Have a construction project? 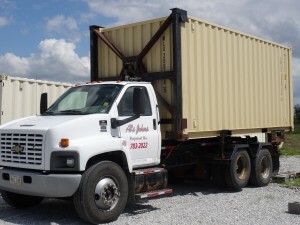 Call us and we will deliver the storage container directly to the job site to keep your supplies safe and secure. As top of the line storage containers in security and durability, you can feel comfortable that your supplies, furniture and belongings are in a good state – locked up and secure at all times. We have 20 foot or 40 foot storage units available depending on your needs. These items are water tight and can be securely locked with a paddle lock. Our units are always cleaned and swept out before delivery. At Al’s Johns in Raymond every item is important to us–it’s why we have one of the best names in the portable storage unit industry. All of your items are dry and secure and are available to you any time that you want them. When you are ready to have your items moved locally, just call us and we will load the storage container for you and take it to your new destination. If you are just needing some extra storage while you are renovating, we can drop off a unit for you to store those extra items. Just let us know where you would like it located on your property and one of our courteous drivers will deliver to you. “Any person engaged in the erection, construction, or alteration of any building, pavement, railroad, sewer, excavation, pipeline, bridge, and all public works in the city shall provide suitable and sufficient toilet facilities for the workers and persons employed in and about said construction, erection, or alteration. (Ord. 15552 / 1; May 14, 1990: P.C./ 8.60.010: Ord. 3480/ 15-201; July 6, 1936).